Westminster Abbey's head of comms tells Sara Luker how he handled the media frenzy surrounding the royal wedding. From trying to rein in Ken Livingstone to keeping the Queen happy, Duncan Jeffery's PR career has been more illustrious and challenging than most. One might forgive the 58-year-old head of comms at Westminster Abbey, for wanting a break after helping to manage arguably the biggest global media event of 2011 - the wedding of Prince William and Kate Middleton. But as PRWeek meets Jeffery he is preparing for the visit of the world's most powerful man, Barack Obama, this week. A parish church, this is not. The team had to then wait to see if Westminster Abbey or St Paul's would be the chosen location for Kate and Wills' big day. Jeffery was called by Clarence House only four hours before the chosen venue announcement. 'It was a challenge to keep up with the media demands,' he adds. Jeffery comes across as genuine, forthright and an all-round good guy. He claims he never promises what he cannot deliver and never lies - 'they come back to bite you'. He started his career as a reporter on local newspapers, then the Press Association and Fleet Street came calling and Jeffery became deputy managing editor at The Sunday Times under Andrew Neil. After four years at The Sunday Times the adventurous Jeffery was bitten by the travel bug and decided to take a job on the Khaleej Times in Dubai. This was followed by roles at the European Council before the pull to return to the UK became too strong. After five years at the Greater London Authority, Jeffery was itching for a new challenge. 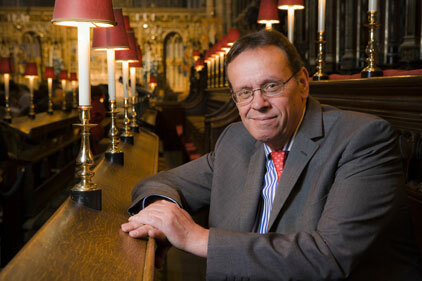 'Coming to Westminster Abbey was like going from one English institution to another,' he jokes. He says its four-strong, 'small but perfectly formed' media team works across a huge variety of events and comms platforms, but always remains mindful of the abbey's core function: 'All our activity has to work around what the abbey is here for - a place of worship. Now all he needs is for Prince Harry to get a move on and do the decent thing. It has to be moving to the Press Association at 85 Fleet Street in 1976. I grew up listening to all my grandfather's stories about the Fleet Street print halls and national newspaper production - I felt I was going home. Peter Roberts, a former editor of the Eastern Daily Press, taught me the twin values of integrity and compassion. He could tear shreds off you one moment and invite you out for a pint in the next breath. An extraordinary man. Never be afraid to take risks and put your neck on the line. Be prepared to do the unexpected even if you have a lot of explaining to do afterwards. I like the people I work with to never be afraid to challenge an organisation's preconceived notions. I like new recruits to be ambitious, push boundaries and not want to stand still.